Louis Blériot was first attracted to the problem of flight when he visited the 1900 Paris Exhibition and saw Clement Ader's strange bat-wing contraption, the Avion No.III. As a result, he built his own bat-wing aeroplane, but unlike Ader's his actually had flapping rather than fixed wings. Unsurprisingly, it was not a success and flapped itself to pieces on the ground. It was an inauspicious beginning for one of the great airmen of history, but demonstrated perfectly his unscientific approach to the subject. The historian Charles Gibbs-Smith saw the main difference between European and American experimenters as being a lack of scientific rigor among the Europeans. Blériot is a good example of this phenomenon. He impulsively jumped from one concept to another and, by retaining those characteristics that worked, he eventually found himself with a practical aeroplane. It was the philosophy of trial and error, and it was something of a miracle that Blériot survived the numerous early crashes that this method entailed. He always tested his own machines. By contrast, the Wrights exhaustively studied each aspect of flight individually and then brought their careful solutions together in one finished design. In 1905, Blériot became acquainted with Charles and Gabriel Voisin, who had built several Wright-inspired gliders for prominent Aéro-Club de France member Ernest Archdeacon. Their latest model was fitted with floats for towing behind a motor boat on the River Seine. Louis Blériot commissioned them to build a similar machine for himself. It had a wide biplane tail, connected by side-curtains to form a boxkite , short stubby wings connected by more side-curtains, and a monoplane forward elevator . Long floats stretched from the elevator back to the tail. It was hoped that these glider experiments would help solve the problem of aerial stability. 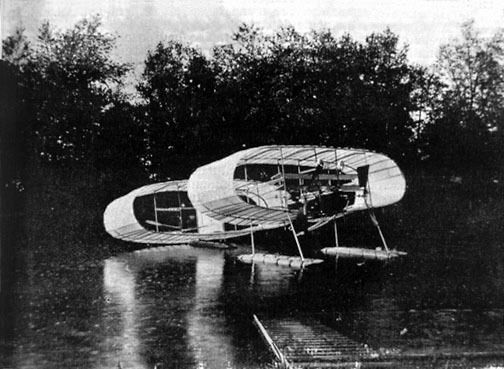 Both gliders were tested by Gabriel Voisin on the Seine near Paris. They both rose from the water, but yawed , dipped and dropped their wings dangerously. Both were damaged by striking the water while out of control. Fortunately, Voisin was uninjured and bravely continued with the tests each time the machines were reconstructed. The problem was that the machines only had one flying control: a front elevator. They relied on their own, very imperfect, inherent stability to keep straight and level. The tests continued into 1906 and the third Blériot-Voisin glider was fitted with an Antoinette petrol engine. (The Antoinette had also powered the motor boat.) But whether it was flown on floats or on wheels as a land plane, the design remained a failure. 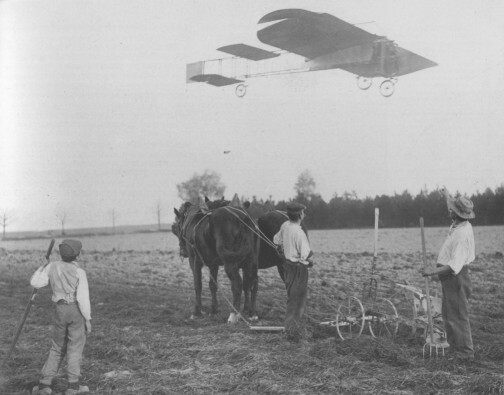 When the gliders met with no success, Blériot decided to pursue his own ideas once more. Unlike most other experimenters of the day, he was particularly attracted to the idea of the monoplane. After Santos-Dumont's successful flights of 1906 he knew flight was a real possibility, and thus encouraged he built a tail-first monoplane, influenced by Dumont's tail-first 14-bis. It was christened the Canard ('duck') because its long 'neck' stretched out in front like a duck in flight. (Since then, the term 'canard' has been used to describe any tail-first aeroplane.) Its wings were covered with varnished paper and it was powered by a 24 h.p. Antoinette. It was first tested at Bagatelle on 21 March 1907, and on 5 April Blériot made a flight of 5 to 6 yards (6 m.). He made further short hops at Issy on 8 and 15 April but the machine was basically too fragile and it was destroyed in a crash on 19 April, from which Blériot was lucky to escape. the wing-warping: left wing is up, right wing is down. After the crash of 19 April, he abandoned the canard and built a plane along the lines pioneered by the American, Professor Langley. It had two sets of wings, the one behind the other, and was called the Libellule ('dragonfly'). The front set of wings had a form of aileron fitted that Blériot would return to in later designs: the wing tips could be swiveled on pivots to change the angle at which they met the air. However, they worked independently and were not connected to each other, as modern ailerons are. There was no elevator. Blériot established longitudinal stability by moving his body weight on a sliding seat. The Libellule was more successful than the Canard. At Issy it managed 25 yards (23 m.) on 11 July 1907, and then 160 yards (146 m.) on 25 July, and 150 yards (137 m.) on 6 August. Finally, on 17 September, Bleriot climbed to a height of 60 feet (20 m.), but he lost control and the machine plunged to the ground (probably a stall ). It was totally wrecked, but again Blériot was fortunate in not being seriously hurt. The Blériot Libellule of 1907. It was flown briefly during the summer. Blériot's third plane in one year was of a type that came to be the standard layout for monoplanes up to the present day. That is to say the engine was at the front near the wings, with the rudder and elevator at the rear on a long tail. The main undercarriage wheels were under the engine and there was a smaller wheel towards the tail. This was completely revolutionary in 1907. But by inspired guesswork, Blériot had hit on a winning monoplane formula. All his future aeroplane designs were variations on this theme. The first of these ground-breaking machines was the sixth aeroplane Blériot had built (including gliders) and so it was simply called No.VI. It was doubly innovative because, in addition to its layout, it had a completely covered fuselage and no external bracing wires - giving it a very modern appearance. It flew 80 yards (73 m.), with a 20 h.p. engine, in November, before being wrecked the following month. The prophetic Blériot VI, also of 1907. In the new year, 1908, Blériot built another, No.VII, which similarly crashed, and then another, No.VIII, which met the same fate. These planes were covered with rice paper to keep weight to a minimum. Blériot's tenacity and enthusiasm sprang from his "passion for the problems of aviation" - his own words for his devotion to flying. And his persistance was paying off. His new machines were generally better than their predecessors and in No.VIII he flew for 800 yards (730 m.)at Issy. This machine had a 50 h.p. Antoinette, and good controls, including large 'modern' ailerons on the trailing edge of the wing. On 6 July he stayed aloft for 8.5 minutes: his best time yet. That autumn, on a modified version, the VIII-bis, Blériot accomplished the second cross-country flight from town to town. It took place on 31 October 1908, the day after Henry Farman had achieved the first. However, Blériot succeeded in flying back to his starting point, making it the first return cross-country in Europe. The flight was made from Toury to Artenay. Attempting to repeat the feat five days later, the VIII-bis was wrecked. The Blériot VIII during an 800 yard flight at Issy. Apart from getting the shape of his aeroplanes right, another great achievement of Louis Blériot was in designing the modern control system. He linked the ailerons and elevator together so that they were both worked from a central 'joystick', while rudder control was via a bar at the pilot's feet. If Blériot wanted to climb, he pulled the stick back. If he wanted to yaw right, he pushed his right foot forward. If he wanted to bank left, he moved the stick left. This is exactly how modern control systems work. By contrast, the Wright brothers had linked their wing-warping (in place of ailerons) to the rudder. This was logical, but was not copied. and the aeroplane combined into one print from two negatives. After losing the short-lived No.IX and crashing No.X in fog in November 1908, Blériot was facing bankruptcy when, in 1909, he took his No.XI to the cliffs at Calais to try and win the £1000 prize for flying across the English Channel. His fortune had nearly all been consumed by his passion for aviation, and moreover by the way he approached it.